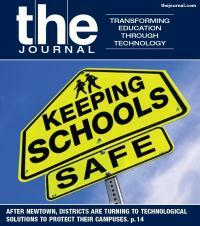 In the wake of the Sandy Hook tragedy, K-12 districts across the country quickly took steps to keep their students and teachers as safe as possible from intruders. We look at technology—from wearable panic buttons to networked surveillance cameras—that schools are using to protect their campuses. Our Space: Executive editor Christopher Piehler declares that magazines are dead, but communities are alive. Here & Now: Check out the winners of the Edgenuity contest to produce videos about online and blended learning. Innovator: Amy Jo Southworth shares her tools for engaging students in a 21st century library. In the quest to create sustainable schools, solar power is a tempting source of energy (and possibly income). This feature looks at how to finance a solar system, how to choose an installer, and how going solar can be both an infrastructure project and an educational opportunity. Both to save money and the environment, schools are embracing networked printing solutions that decrease the number of machines in use, allow for detailed tracking of who prints what, and outsource maintenance to vendors. SETDA Deputy Executive Director Geoffrey H. Fletcher fills tech leaders in on everything they need to know about new initiatives designed to make student data interoperable. iPads were created as devices for individual consumers, so teachers have their work cut out for them in using tablets for student collaboration. We highlight apps that help educators turn iPads into wePads. Mobile devices have made augmented reality a promising means for engaging students in a number of subject areas. But is AR really coming to a classroom near you? We explore how augmented reality is currently being used, and where it might be headed in the near future.